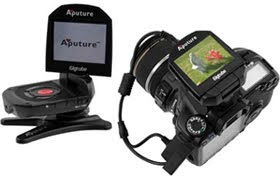 The Aputure released Gigtube, a very useful accessory, which is much needed by photographers since first DSLR's with live view appeared. It is an innovative remote viewfinder device that includes a LCD screen. Compatible with any camera with a video output, the screen can automatically display an image immediately after shooting it, or can stream the video feed from live view. Moreover, the LCD screen is rotatable for different angle views and this gadget offers the remote shutter release function. There are several models available for most well-known Canon and Nikon cameras. The one for Canon Rebel series should work with the Powershot G10 also, since remote release sockets are compatible. Not as versatile and convenient as articulated screen on the G11, but still very useful.